Heart London is a regional radio station owned and operated by Global Radio as part of the Heart network. 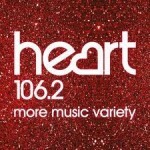 On 25 June 2007 it was announced that Heart along with its sister stations The Arrow, Sky News Radio, LBC and Galaxy were to be sold for £170 million to Global Radio from Chrysalis Radio. The station broadcasts from studios at Leicester Square in London. With ‘More Music Variety’ Heart plays the best variety of music with witty banter and celebrity guests.